423- Garcia-Burillo, S., Combes F., Boone, F., Schinnerer, E., Baker, A. J., Hunt, L. K., Eckart, A., Tacconi, L. J., Neri, R., Leon, S., Englmaier, P.: 2004,	Molecular gas in NUclei of GAlaxies (NUGA): interstellar gas an torques in NGC 4579, 4826 and 6951 SF2A-2004 Paris conference, EdP-Sciences, p.
422- Bournaud, F., Combes F.: 2004,	Evolution of galaxies along the Hubble Sequence: secular evolution, galaxy interactions, and gas accretion, SF2A-2004 Paris conference, EdP-Sciences, p.
421- Salomé, P., Combes F.: 2004,	Molecular gas maps of the RXJ0821+07 cluster core, SF2A-2004 Paris conference, EdP-Sciences, p.
420- Salomé, P., Combes F.: 2004,	Cold molecular gas in cooling flows SF2A-2004 Paris conference, EdP-Sciences, p.
419- Rodriguez-Fernandez, N. J., Combes F.: 2004, Molecular survey in the Galactic Center, SF2A-2004 Paris conference, EdP-Sciences, p.
417- Salomé P., Combes F.: 2004, Cold molecular gas in Abell 1795, in "The Riddle of Cooling Flows in Galaxies and Clusters of Galaxies", Eds T. Reiprich et al. 400- Verdes-Montenegro L., Sulentic J., Espada D., Leon S. Lisenfeld U., Huchtmeier W., Odewahn S., Verley S., Yun M. Combes F.: 2003, A reference sample: ISM for the most isolated galaxies, in IAU Symp. 217, Recycling intergalactic and interstellar matter, ASP Conf Series, p.
398- Le Floc'h E., Duc P., Mirabel F., Sanders D., Combes F., Kneib J-P., Bosch G., Courvoisier T., Minniti D., Greiner J.: 2003, Are the cosmic GRBs reliable tracers of star formation? in Symp. 216, Maps of the Cosmos, ASP Conf Series, p.
395- Combes F.: 2003, Molecular gas and AGN fueling, SF2A-2003 Bordeaux conference, EdP-Sciences, p.
394- Melchior A.-L., Combes F., Pennypacker C., Wood-Vasey M. : 2003, Host galaxies of core-collapse supernovae, SF2A-2003 Bordeaux conference, EdP-Sciences, p.
393- Salome P., Combes F.: 2003, Mapping the cold molecular gas in the cooling flow cluster Abell 1795, SF2A-2003 Bordeaux conference, EdP-Sciences, p.
392- Combes F.: 2003, Supermassive black holes (SMBH) and formation of galaxies, SF2A-2003 Bordeaux conference, EdP-Sciences, p.
379- Bournaud F., Combes F. 2002, Formation and properties of polar ring galaxies, SF2A-2002 Paris conference, EdP-Sciences, p.
378- Combes F., Leon S. 2002, "Molecular gas in the double-barred Seyfert 2 galaxy NGC 5728" SF2A-2002 Paris conference, EdP-Sciences, p.
377- Combes F., Garcia-Burillo S., Boone F., Hunt L. K., Leon S., Eckart A., Baker A., Tacconi L., Englmaier P., Schinnerer E., Neri R. 2002, "Molecular gas in the 3-ringed Seyfert/Liner galaxy NGC 7217" SF2A-2002 Paris conference, EdP-Sciences, p.
376- Horellou C., Black J. H., van Gorkom J. H., Combes F., van der Hulst J. M., Charmandaris V. 2002, "Gas in and around the Merger Galaxy NGC 1316 (Fornax A)" SF2A-2002 Paris conference, EdP-Sciences, p.
375- Le Floc'h E., Mirabel, I. F., Duc P.-A., Sanders D., Combes F., et al. 2002, "Gamma-ray Burst Hosts galaxies : a new cosmic window on galaxy evolution" SF2A-2002 Paris conference, EdP-Sciences, p.
343- Combes F., Terlevich R.: 2001, "Structure, Dynamics and Environment of Galaxies", Discussion of Session 4, Granada Proceedings, in "The Evolution of Galaxies: I- Observational Clues", ed. J.M. Vilchez, G. Stasinska and E. Perez, A and SS p.
326- Charmandaris, V., Combes F., 2000, Minor Mergers and the Formation of Shell Galaxies in Small Galaxy Groups: IAU Colloquium 174, ASP Conference Series, Volume 209. Edited by Mauri J. Valtonen and Chris Flynn. P. 273. 302- Combes F. (1999) "CMB and molecules at high redshift", in " 3K Cosmology" Conference, Roma, October 1998, ed F. Melchiorri, p.
301- Combes F. (1999) "Evolution of Galaxies on Cosmological Timescales", Tenerife Dec 98 Conference, PASP Series, ed Terry Mahoney and John E. Beckman, Vol 187. 292- de Vega H., Sanchez N., Combes F.: 1998, "Fractal Structures and Scaling Laws in the Universe: Statistical Mechanics of the Self-Gravitating Gas `Journal of Chaos, Solitons and Fractals': `Superstrings, M, F, S...theory', M. S El Naschie and C. Castro, Editors. 272- Jungwiert B., Combes F., Palous J. (1998) "The role of stellar mass-loss in dynamics of spiral galaxies", in "Dynamical Studies of Star Clusters and Galaxies", Parallel Meeting P5 of JENAM 1998, held in Prague, Czech Rep., Sep. 9-12, 1998, Convenors and Editors of P5: P. Kroupa, J. Palous, and R. Spurzem, published by ESA Publ. Division, c/o ESTEC, Noordwijk, The Netherlands. 265- Leon, S., Combes F., Leeuwin, F., 1997, Disk-shocking on globular clusters (NGC 5139), in The Combination of Theory, Observations, and Simulation for the Dynamics of Stars and Star Clusters in the Galaxy, 23rd meeting of the IAU, Joint Discussion 15, Kyoto, Japan. 260- Wiklind T., Combes F. (1997) "Molecular absorption lines at high redshift", Cordoba Proceedings, Argentina, Conference October 1996, p.
258- van Driel W., Combes F. (1997) "Dark matter in the PRG NGC 660", in "Dark and visible Matter", Sesto Pusteria Proceedings, July 1996, p.
256- Leon S., Combes F., Menon K. (1997) "Molecular gas in compact groups", Proceedings of Mexico conference, July 1996, p.
254- Wiklind T., Combes F.: (1997) " Probing the Interstellar Medium at High Redshift, Using Molecular Absorption lines", in Proceedings of IAGUSP Workshop on Young Galaxies and QSO Absorbers, Santos, Brazil, p.
238- Becquaert J-F., Combes F., Viallefond F. (1996) " Galactic Warps", in "Structure and Evolution of Stellar Systems" Petrozavodsk conference, August 1995, ed. A. Mullari, V. Orlov p.
233- Junqueira S., Combes F. (1996) "Asymmetries m=1 in spiral galaxies" in "Observational Cosmology: from Galaxies to Galaxy Systems", Sesto Pusteria Proceedings, July 1995, p.
226- van Driel W., Mulder P., Combes F. (1996) "Modelling the merger NGC 3310", in ESO-IR conference, Munich, June 1995, p.
222- Combes F. (1996) "Massive black holes in nuclei and galaxy dynamics: the puzzle of the M31 double nucleus", in "Structure and Evolution of Stellar Systems" Petrozavodsk conference, August 1995, ed. A. Mullari, V. Orlov, p.
218- Horellou C., Casoli F., Combes F. (1996) "Atomic and Molecular Gas in Ring Galaxies", Proceedings of Tucson meeting, ed. 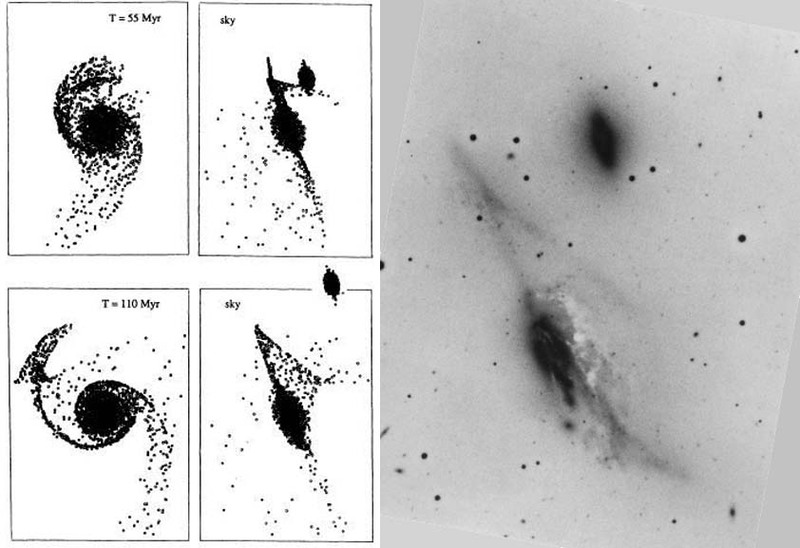 S. Radford p.
213- Drinkwater M.J., Webster R.L., Francis P.J., Peterson B.A., Wiklind T., Combes F., (1996) " Dust-reddened Quasars", in "Millimeter-wave Astronomy", ATNF Sydney workshop, Proc ASA, p.
209- Pfenniger D., Combes F.: (1995) "Cold molecular gas as dark matter candidate in galaxies and clusters", Proceedings Maryland colloquium, October 1994, American Institute of Physics Press, p.
189- Pfenniger D., Combes F. (1995) "Is galactic dark matter cold molecular gas? ", Villards meeting, Jan. 1994, Proceedings, p.
185- Reshetnikov V., Combes F. (1994) "UGC5101: Ultraluminous IRAS galaxy with circumnuclear star formation" in "Violent Star Formation from 30 Doradus to QSOs", ed. Tenorio-Tagle, Cambridge University Press, p.
84- Encrenaz T., Billebaud F., Lellouch E., Combes F., Gerin M., Maillard J.P. (1989) "Observation of CO on Mars in the infrared and millimeter range" in Infrared Spectroscopy in Astronomy" Eslab Symposium, Salamanca (Espagne), p.
64- Combes F., (1988) Collisions between galaxies L'Astronomie (ISSN 0004-6302), vol. 102, Jan. 1988, p. 11-18. 45- Combes F., Boulanger F., Encrenaz P.J., Gerin M., Bogey M., Demuynck C., Destombes J.L., (1985), "Detection of interstellar CCD", Proceedings of ESO Symposium, Aspens, Sweden, June 85, p.
44- Boulanger F., Casoli F., Combes F., Dupraz C., Gerin M., (1985), "Comparison of CO and IR emission of IRAS unidentified sources", in "Light on dark matter; first international IRAS symposium", Leiden June 85, p.
43- Combes F., Paubert G., Encrenaz T., Lellouch E., Courtin R., (1985), "Observations of Jupiter and Saturn in the J=1-0 PH3 line", B.A.A.S. 23- Combes F., (1980), "Nuages moleculaires et structure spirale", colloque de Goutelas, Comptes-rendus. 22- Combes F., (1980), "Dynamique et structure des galaxies", PhD Thesis, Paris VII. 12- Combes F., Baudry A., (1978), "Molecular line observations toward CRL 2591 (UCA 27) 3rd Gregynog Astrophysics Workshop, Wales", in Giant Molecular Clouds in the Galaxy, ed. Solomon and Edmunds, p. 89. 9- Combes F., Encrenaz P.J., (1977), "Observations des raies dans le domaine radio", Journal de Physique n5 Supp, Tome 39, C1-131. 8- Combes F., Encrenaz P.J., Lucas R., Weliachew L., (1977), "Observations du monoxyde de carbone dans M31", Journal de Physique n5 , C1-107.